The band was active in the 1850s, the conductor being one, S. Morley. 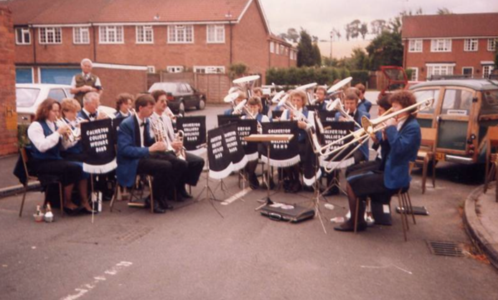 On July 22nd, 1878, the band played at the Calverton and District Floral and Horticultural Show. Conducted by Mr Morley, its concert programme was: Sympathy (R. Smith), Defence (J. Frost), Cavatina (Bellini), The Sea Lion (J. Wright), Rose of Love (R. Smith), Golden Sunbeam (H. Round), Killarney (T. Haigh), We Don't Want to Fight (J, Metcalf), Queen's Prize (H. Round), Every Land's My Home (Blair). 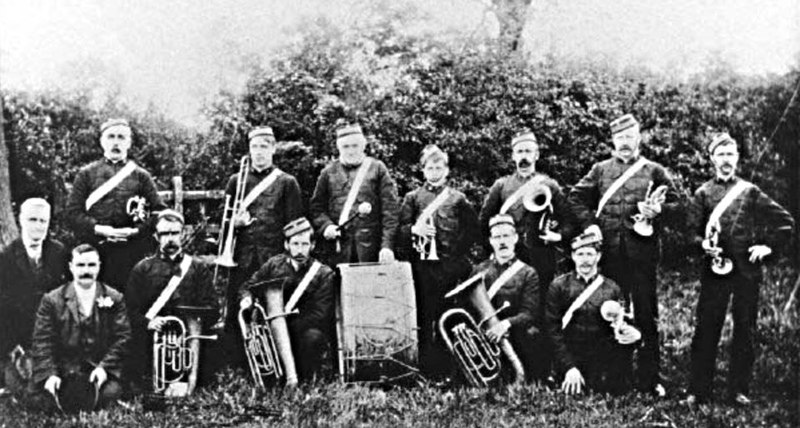 An article in the Newark Advertiser reported that the band played for them in Newark in 1902. "The annual club feast in connection with members of the Ancient Order of Druids was held on Thursday last. 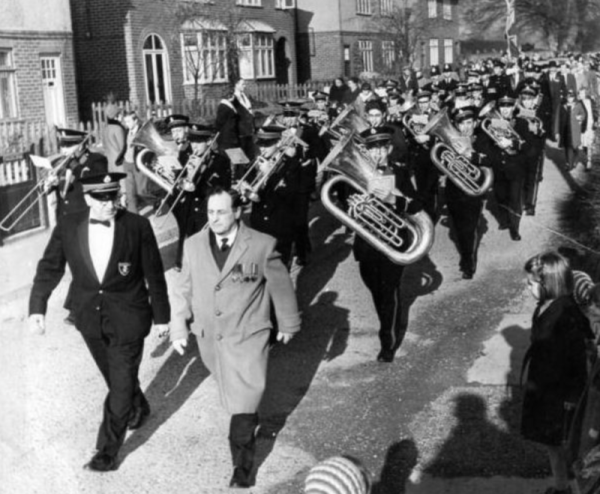 The members marched in procession to the parish church, headed by the Calverton Brass Band". This photograph, below, was taken about the same time at the top of Hall Park. The band seems to have folded in the early 1900s presumably during wartime. When the village began to grow it brought with it miners from other coalfields especially Durham. 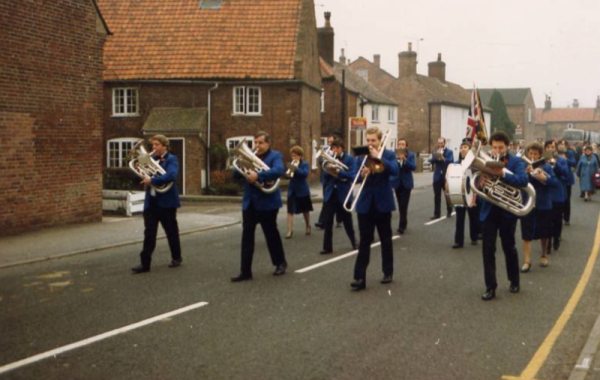 This introduced skilled musicians to Calverton, who in turn re-formed the band. 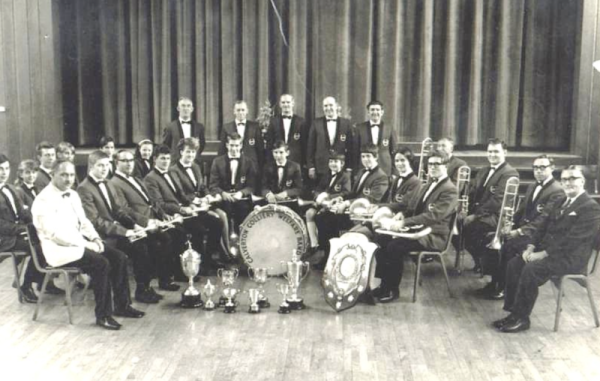 Instruments were provided by the Miners Welfare Organisation and a new band was born. 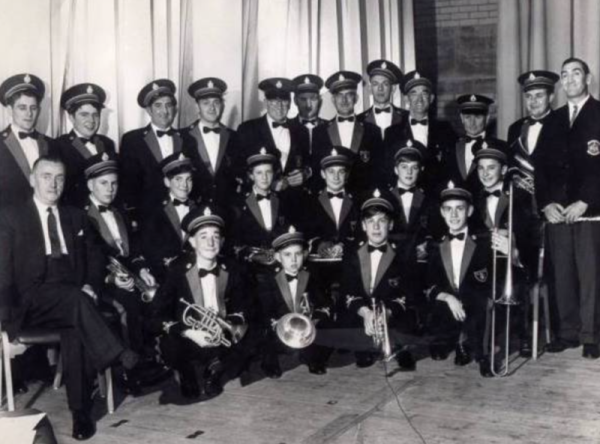 Rehearsals were held in the pit canteen through the 50s and early 60s and senior band members, particularly Ron Selby and Norman Molineux of Lee Road, trained a significant amount of local boys and girls into the art of reading music and playing brass instruments. This led to the creation of a formidable contesting band as the youngsters became highly skilled musicians. Led by Norman Brown the band had significant successes throughout the 60's in major competitions, from the Eisteddfod, Llangollen, Wales to the Albert Hall, London. 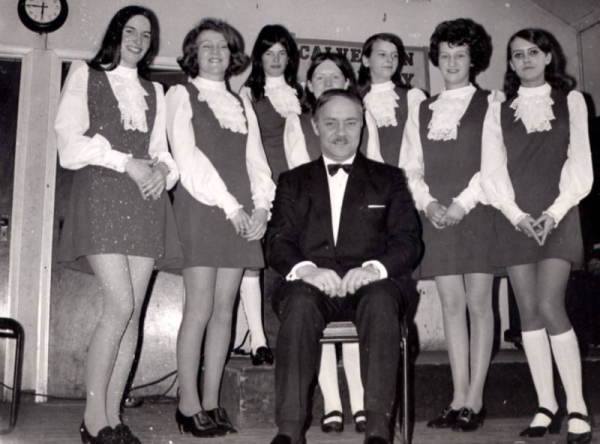 In addition, due to the prolific compositions of Mr Brown, the band became renowned for playing contemporary music for concerts held throughout the midlands. 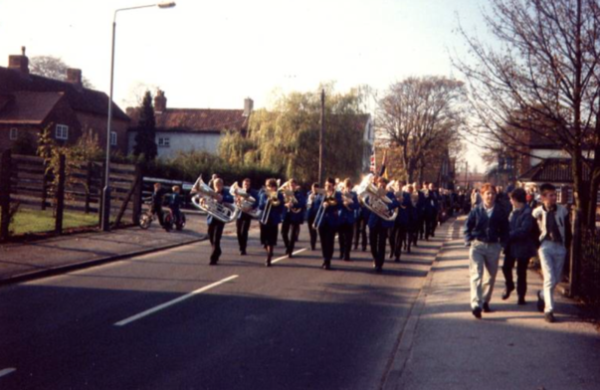 Every weekend the band would be performing at a concert hall, club, pub or park. 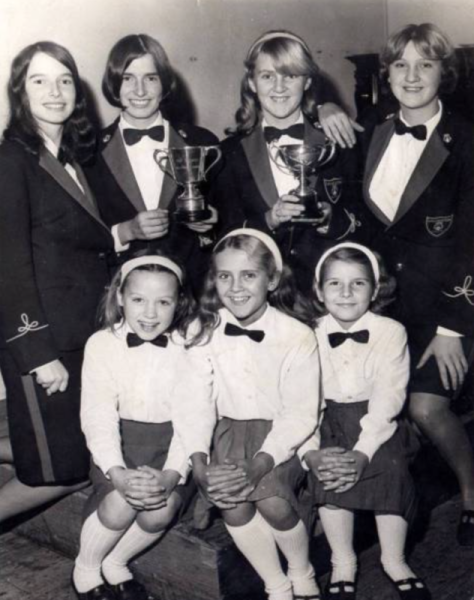 The band had its share of tragedies too, losing one of its fine young players, Shirley Wild, aged 11, to a traffic accident, during a band competition in Chesterfield. Later on Norman Brown would become too ill to lead the band. 1963 band marching. David Nabarro leading the way. 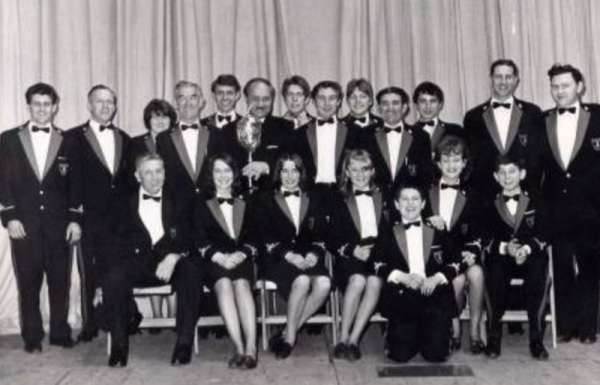 From 1965 to the early 1980s the band competed at all the major national competitions an most often came home with many trophies and awards. You have to think that this was at a time when children didn't have distractions in the same way they do today and neither did the adults. It's not like they would spend hours on the computer and the adults would be answering their smartphones every two minutes......... They had the time to really concentrate on the band. 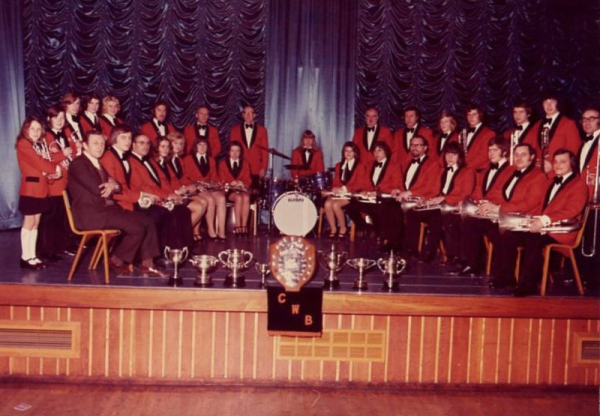 At that time brass bands had four seperate sections or divisions based upon ability and the only way to get to the top division was to compete against all other bands in both area and national championships. With a great deal of help from a top class Musical Director, Norman Brown of Hucknall, the band saw the top section as a reality. The band's strength lay within its members, families and fans - who raised funds for uniforms, instruments and travel costs. In addition the band had one of the highest ratios of female to male players and their skills and abilities were just as good, and in some cases, better than those of their male peers. Calverton started right at the bottom of the tree in section number four. By the late 1970's it had attained a position in the First section playing against the finest bands in Europe. 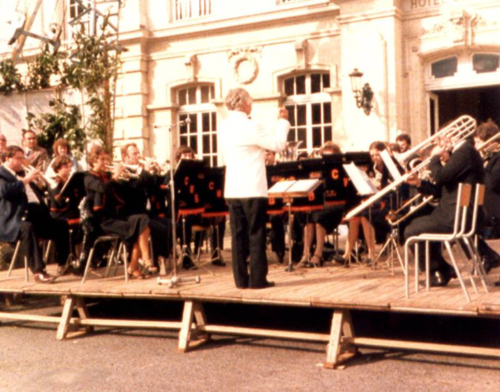 The band travelled far and wide during the 1970's and early 1980's and was an integral part of the twinning activities with Longue-Jumelles. The band travelled on a number of occasions to the French town, and entertained the local people with their upbeat as well as many, skilful, concert repertoires. Every November the band was called on to both lead the Remembrance Day parade and sound the last post at the St Wilfrids Church and Mansfield Lane Cemetery. During the mid 1980s band members slowly left to pursue other interests. A number moved overseas, (some still playing in brass bands in far flung places such as New Zealand and Thailand). Others used their skills to become professionals such as teachers and musicians, or simply moved on to play with other town bands. A number of players retired altogether, although they remain in the village and reminisce over the glory years of the band. The closure of the Colliery was the final death knoll for the band. The village not only lost a pit, but also an accomplished group of musicians that for thirty years provided recognition for the small mining village of Calverton. Most of the original players still remain in contact with each other. In fact many of them are sisters, brothers, as well as being married to other members of the same band. Page wouldn't have been created, but for the fantastic work of the ex Brass Band member Malcolm Carter. Extra information provided by Gavin Holman.